I am starting again with the preliminaries,which I haven’t read in a long while. Preliminaries are important concepts or truths. I take notes from Trungpa, but I translate all this into my current understanding, such as it is in any given moment. It is all I can ever do, which is why I continue to study these teachings. Boddhichitta translates as an awakened mind-heart. I relate to having an open heart as having compassion for the pain and suffering of even and maybe especially my enemy. Worst case scenarios are good for testing your ability to have an open heart. I may need to draw boundaries, and I also see that even my enemy is suffering, has desires, wishes, loved ones, a life, and has been hurt. It took me 20 years to come to understanding how to stand in one spot, grounded in this time and space, with the dichotomy of fear and aggression and boundaries or even having to close a door on a hurtful alcoholic family member, while also in the same moment being able to not shut down, to feel all the human feelings, and to send love to the one who is potentially dangerous in a very real way. During the course of getting sober I found that alcohol covered up so much anger and pain of my own. I believe many alcoholics drink not to feel the uncomfortable and painful feelings. So in this case, a good example and personal scenario, I can say that now I can feel the sadness for the path toward destruction, feel the hopelessness and fear of the alcoholic family member, know that I may need to say no or otherwise draw boundaries, and simply, to love them. Love them in the moment and with all my heart, while drawing safe boundaries as may be necessary. This is a huge leap from what I was raised with, and allows me to feel some of the spaciousness of which Trungpa speaks. Alaya is a state of non-fear, openness, before there was the division of ego. I have only glimpsed that state in meditation, and so, it is a goal to experience, not one I can discuss well. Next week, Friendliness . . . or more preliminaries! This entry was posted in addiction, autobiography, buddhism, compassion, journal, lojong, tonglen and tagged alaya, relative bodhichitta, ultimate boddhichitta. Bookmark the permalink. I understand. It is not going anywhere, and I wrote it before. I am also in that place. 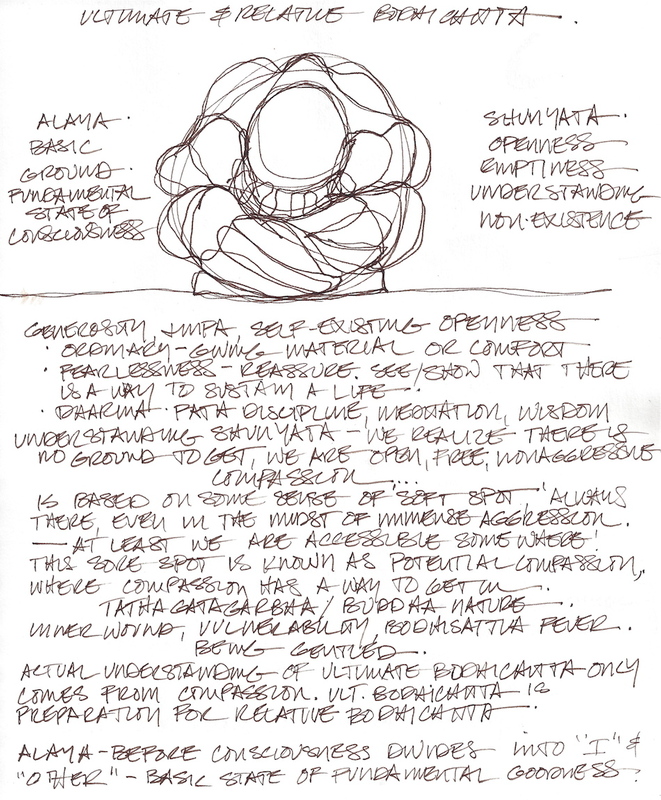 Mostly Buddhism, and a drawing, my practice. . .